The St. George location offers free Wi-Fi and TVs with sports channels. This location does not have a private space, but can accommodate large parties that call ahead. Awesome Place! Love the Fingers! 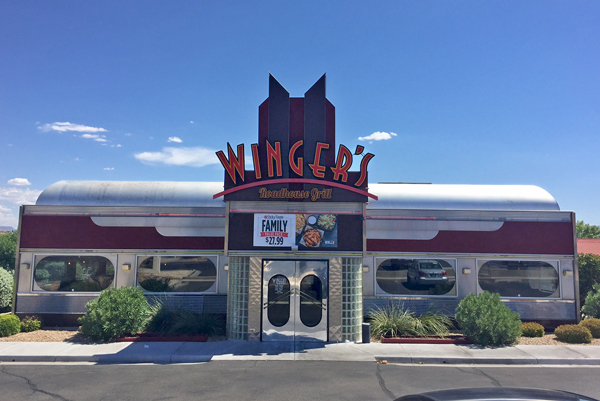 Best place for wings in St George Utah! Great customer service and the food was bomb! Yeah they have good wings and food. Hard to go wrong with Wingers unless you can't taste anything. My Wing dinner came with a bunch of wings absolutely slathered in the sauce. Best waitress that we have ever had! The food was real tasty and service was great. Great good , great service!! Thanks Skyler!!!! This is the best place for wings. the wings Are pretty cheap but the other things like soup and salad are pretty expensive I would recommend you get the sticky wings not too spicy but amazing taste way better than buffalo wild wings. Sticky finger sauce is amazing! Great beer and environment! Took some friends from out of town cause we LOVE their wings and it's not a "box" national chain! We were not disappointed! It was very busy, but our young server was amazingly attentive to our group of 11 on two tables. Food was timely, hot, tasty, lots of it & what everyone wanted! Love the remodel too!!! Much improved from 10 years ago, remodeled facility and service was great. Food was great. Great service and the waiter was awesome! Thanks skyler great job! Wingers is a great place for lunch during the week. Their daily specials are perfect. The ambient is more relaxing than other places that sell wings. Their food is just finger licking good and i prefer this place better rather than the one across the street. We stop here every time we travel through! Would never stop anywhere else! The popcorn is back! Their sicky fingers are one of the greatest inventions ever created. Customer service was great & our food came out really quick. Love the new look of the restaurant! They have a great new remodel. The servers were really nice and the food was great like always! Other than naked wings, I would recommend their loaded bird. It is super yummy! You can't go won't with chicken, cheese and bacon 肋! Oh and the garlic fries are amazing. Try them with the creamy amazing sauce! MmmmThey have gluten free and vegetarian options as well. They also honor a military discount! Go support the heck out of them. You know, I was going to just rate this restaurant a 4 star just because I've eaten there so often. But then I thought about it and I can only recall one bad meal at Wingers and it wasn't at this location. That's a pretty stellar record for having eaten there 25+ times. Great flavors. Service is often 4 star, but we'll round up from the average of 4.5 to 5 to reward consistency. Probably the nicest Wingers I've ever been to. The inside looks better than the outside. Amazing! We went for lunch after a long time of not going and it’s a lot better than last time! All the food was good and our server, Terrance I believe, was super cute and sweet! She recommended the sticky finger tacos, and they were delicious! They were only about $9.00 for two tacos and they are definitely a good size! Phenomenal burger (sorry, didn't try the wings). Onion rings were great too. Service was top notch. I will absolutely be going back. Phenomenal burger (sorry, didn't try the wings). Onion rings were good too. Service was top notch. I will be going back. I love Wingers, their original sauce is amazing! Also, I would definitely suggest trying their asphalt pie. It's delicious! Clean place. Fast service. Good food. Very impressed! Food was very flavorful and well proportioned. Hostess and server were great. My wife and I are new to the area and yet to find a place to get some apps and watch the game. This place will be our go-to. Sticky finger salad with creamy amazing dressing... So good! Food and customer service were great, will be back. Highly recommend. Really good place, in fact one of my favorites, staff were cool, foods good and was really calming to spend time there I really enjoyed it there. This place has become a bit pricier than it used to be, but damn if it ain't some of the best chicken in town!